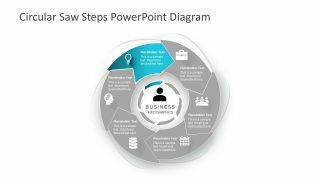 The Circular Saw Steps PowerPoint Diagram shows 6 segments in the chevron shape. It is a process flow diagram, ideal for displaying the iterative set of activities. This circular saw steps template is a presentation tool for users to create a custom diagram. 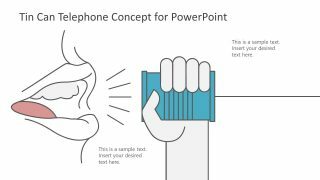 They can simply change the text and personalize the layout of slides in minutes. 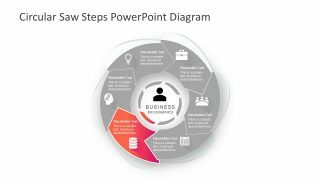 That’s why this template can benefit the professionals in different fields to demonstrate topics without a comprehensive knowledge of PowerPoint. 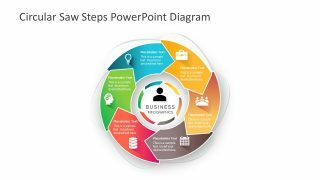 For example, changing the colors of the circular saw segments, the background of slides, or replacing the clipart icons. These icons visually represent each segment of the diagram. 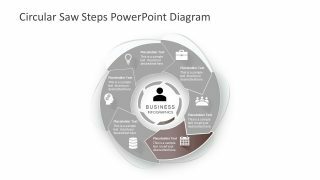 The Circular Saw Steps PowerPoint Diagram is useful in project reporting presentations. And especially while discussing a conceptual model and process workflow. The diagram has a series of overlapping chevron shapes with white blades. These overlapping chevron segments display the relationship of stages in the diagram. The users can create a colorful and elegant presentation with the 6 steps circular saw. While the circular saw illustrates a powerful tool for cutting objects. 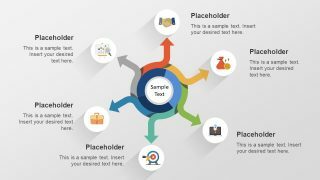 The colors of the template diagram, on the other hand, increase the audience attention. 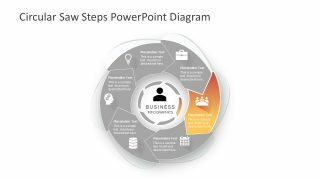 And, the diagram guides the viewers towards the flow of the process in one slide at a time. The template highlights one segment of the circular chevron per slide for this purpose. The PowerPoint diagram template of circular saw steps highlights the core with another circular shape. 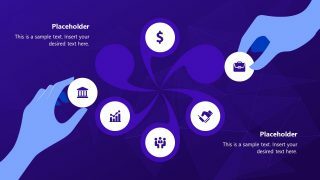 Although the template shows rainbow colors in diagram, the users can change these from shape fill or gradient effects option. Often the circular flow incorporates the organizational procedures into a system. For example, a performance reporting mechanism of a company or the monitoring in each stage of product development. 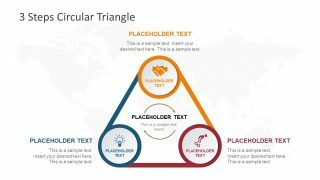 Simply edit the title and description placeholders inside each segment of the diagram to impress the audience.